Any disease of the heart muscle that interferes with the heart’s ability to pump blood with sufficient force is called cardiomyopathy. Cardiomyopathy develops slowly and may produce no symptoms until the later stages, except when caused by viral infections. It is an uncommon disorder, accounting for only 1 percent of heart disease fatalities. But, it is one of the more common causes of serious heart disease in younger people. Coronary artery disease causes cardiomyopathy in the elderly. Treatment may include medications, implantable devices or, in severe cases, a heart transplant depending upon the type of cardiomyopathy. Dilated cardiomyopathy – The pumping ability of your heart’s main pumping chamber — the left ventricle — becomes less forceful in this entity. It is the most common type of cardiomyopathy. There is enlargement of (dilated) left ventricle which can’t effectively pump blood out of the heart. This type is most common in middle-aged people and is more likely to affect men. 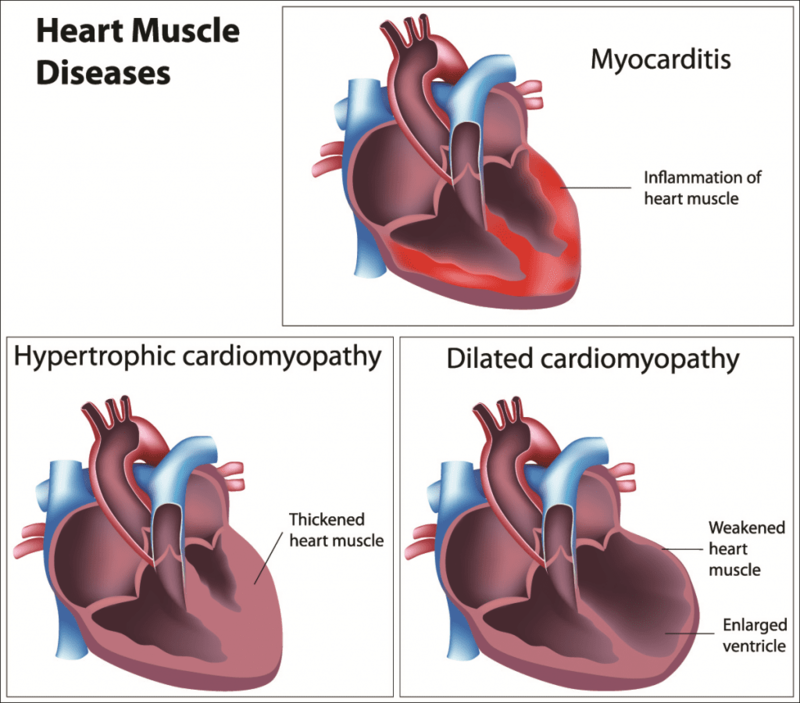 Hypertrophic cardiomyopathy – In this condition, there is abnormal growth or thickening of your heart muscle, particularly affecting the muscle of your heart’s main pumping chamber. This cause the heart tends to stiffen and the size of the pumping chamber may shrink, interfering with your heart’s ability to deliver blood to your body. This condition becomes very severe if it becomes apparent during childhood. There is a strong family history of the disease, and some genetic alterations have been linked to this disease. Restrictive cardiomyopathy – In this condition, the heart muscle becomes rigid and less elastic. This means the heart can’t properly expand and fill with blood between heartbeats. It is a disease of old age mostly. It is a rarest of all three types of cardiomyopathies. It can occur for no known reason (idiopathic). It is also associated with diseases elsewhere in the body that affects the heart. There is a lot of variations in the symptoms of cardiomyopathy. Possible symptoms of hypertrophic cardiomyopathy are generally same as the symptoms of dilated cardiomyopathy. Rarely the first symptom may be fainting or even sudden death. It can also cause heart attack, usually during exercise. Possible symptoms of restrictive cardiomyopathy are fluid accumulates in the legs and abdomen. This condition also can cause shortness of breath, especially during exertion. Irrespective of the type of cardiomyopathy you have, signs and symptoms tend to get worse unless treated. This worsening happens quickly in certain people, while in others, cardiomyopathy may not worsen for a long time. Chest X-ray: Images of your heart and lungs are displayed by this test. Also, other conditions can be looked into that might explain your symptoms and to see if you have an enlarged heart. Electrocardiogram (ECG): It is an electrical recording of the signals as they travel through your heart. Evidence of a previous heart attack can be revealed by an ECG. If the signs and symptoms of your atherosclerosis are more evident during exercise, your doctor may ask you to walk on a treadmill or ride a stationary bike during an ECG. Echocardiogram: It is a type of ultrasound examination of your heart to produce images of the heart. These images are seen by the doctor to identify heart attack-related problems, including whether there are areas of your heart not getting enough blood or heart muscle that’s been damaged by poor blood flow. Sometimes, an echocardiogram is performed during a stress test. Coronary angiography: Narrowing or blockade in coronary arteries can be revealed by this test. The test involves injecting a liquid dye into the arteries of your heart through a long, thin tube (catheter) that’s fed through an artery, usually in your leg, to the arteries in your heart. The arteries become visible on X-ray, as the dye fills your arteries. Any area of blockage can then be revealed. Cardiac computerized tomography (CT) scan: During the performance of this test, you lie on a table inside a doughnut-shaped machine. Inside the machine, there is an X-ray tube which rotates around your body and collects images of your heart and chest. These images can show if any of your heart’s arteries are narrowed or if your heart is enlarged. Blood tests: A simple blood test can measure B-type natriuretic peptide (BNP), a protein produced in your heart. Its level increases when your heart is subjected to the stress of heart failure, a common complication of cardiomyopathy. Many other blood tests, including those to check your kidney function and look for anemia and thyroid problems, might be done. Your doctor may order for checking your iron level. Increased iron in the blood may indicate an iron overload disorder called hemochromatosis. Accumulating too much iron in your heart muscle can weaken it and cause cardiomyopathy. Heart failure: In this condition, your heart can’t pump enough blood to meet your body’s needs. The ability of the thickened, stiffened or weakened heart muscle due to cardiomyopathy is reduced for pumping. Heart failure can be life-threatening if left untreated. Blood clots: You’re more likely to have blood clots form in your heart if you have cardiomyopathy because your heart can’t pump effectively. Blood clots coming out of your heart can enter your bloodstream, and block the blood flow to other organs, including your heart and brain. Blood clots developing on the right side of your heart may travel to your lungs (pulmonary embolism). Your doctor may prescribe a blood thinner (anticoagulant medication), such as aspirin, clopidogrel or warfarin to reduce your risk. Valve problems: Two of the heart’s four valves — the mitral and tricuspid valves — may not close properly because people with dilated cardiomyopathy have an enlarged heart. This can lead to a backward flow of blood. This flow creates sounds called heart murmurs. Cardiac arrest and sudden death: Abnormal heart rhythms can arise out of all forms of cardiomyopathy. Some of them are too slow to keep blood flowing through your heart effectively, and some are too fast to allow the heart to beat properly. These abnormal heart rhythms, in either case, can result in fainting or, in some cases, sudden death if your heart stops beating. The management of cardiomyopathy aims to reduce your signs and symptoms, prevent your condition from worsening, and decrease your risk of complications. Treatment varies by which of the major types of cardiomyopathy you have. Angiotensin-converting enzyme (ACE) inhibitors: These improve your heart’s pumping capability. Angiotensin receptor blockers (ARBs): These are for patients who can’t take ACE inhibitors. Beta blockers: These improve heart function. Digoxin (Lanoxin): Also called as digitalis, this medication increases the strength of your heart muscle contractions. It also tends to slow the heartbeat. Diuretics: These are the “water pills” that make you urinate more frequently and keep fluid from collecting in your body. In some cases, a special pacemaker is implanted that coordinates the contractions between the left and right ventricles (biventricular pacing). Drug therapy or an implantable cardioverter-defibrillator (ICD) may be options in people who may be at risk of serious arrhythmias. Septalmyectomy: It is a type of an open-heart operation in which the surgeon removes part of the thickened, overgrown heart muscle wall (septum) that separates the two bottom heart chambers (ventricles). This removal improves blood flow and reduces mitral regurgitation. Most patients improve with this surgery and have no further symptoms. Septal ablation: In this treatment, a small portion of the thickened heart muscle is destroyed by injecting alcohol through a catheter into the artery supplying blood to it. There are possible complications with this procedure, including heart block — a disruption of the heart’s electrical system — which requires implantation of a pacemaker. Although the long-term success of this procedure isn’t yet known, it’s becoming more commonly used. Pacemaker implantation: In this procedure, a small electronic device is inserted under your skin that sends electrical signals to your heart to monitor and regulate your heartbeat. This procedure is generally done under local anesthesia and typically takes less than three hours. But, this procedure is not as effective as surgical options, but it’s sometimes used in older people who want to avoid more invasive procedures. Implantable cardioverter-defibrillator (ICD).In this procedure, a pager-sized device is implanted in your chest like a pacemaker. This device continuously monitors your heartbeat. In case a life-threatening arrhythmia is detected, the ICD delivers precisely calibrated electrical shocks to restore a normal heart rhythm. In patients at risk of a sudden cardiac death because of abnormal heart rhythms, this device is very useful. The management of this condition aims at improving symptoms. The advice you will receive from a doctor will recommend you to pay careful attention to your salt and water intake and monitor your weight daily. Diuretics might be recommended if sodium and water retention becomes a problem. Blood pressure lowering medications also may be prescribed to lower your blood pressure and control fast or irregular heart rhythms. A heart transplant may be an option if you have severe cardiomyopathy and medications can’t control your symptoms. Even people who are critically ill may have a long wait before having a heart transplant because of the shortage of donor’s hearts. A mechanical heart assist device can help In some patients who are critically ill as they wait for an appropriately matched donor. These devices, known as ventricular assist devices (VADs), can help blood circulate through your heart for months or even years.VAD therapy could be a long-term treatment option for some people who aren’t candidates for a heart transplant. Get modest exercise after discussing with your doctor the most appropriate program of physical activity. Eliminate or minimize the amount of alcohol you drink. Specific recommendations will depend on the type of cardiomyopathy you have. Having a normal blood pressure. Eat a diet rich in vegetables and fruits. Take medication as needed. Not taking more than two alcoholic beverages per day. Do not drink alcohol at all if you are at high risk of dilated cardiomyopathy. Contact your doctor for the evaluation if you have any family members with inherited cardiomyopathy.